What is the purpose of Hadamarding and then measuring messages during teleportation? 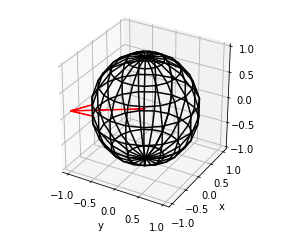 I'm trying to build something called bloch sphere. This represents a state of a quantum bits in the form of an arrow in a sphere, whose radius is 1.0. I wrote the codes below. When I put (theta, phi) = (30,0), the tip of the arrow reaches the surface of the sphere. However, when I put (theta,phi) = (30,30), the tip of the arrow goes outside of the sphere. You can see the image of the current situation from the link below. Also, numpy trigonometric functions accept values in radians. So, theta should be in the range [0, pi], phi should be in the range [0, 2 * pi). To convert degrees to radians you may use numpy.radians(). 1. Entangling here and there by applying a Hadamard gate and CNOT gate. 2. Sending the message using a CNOT gate and a Hadamard gate. 3. Taking a measurement of the first and second qubits, message and here. 4. Applying a NOT gate or a Z gate, depending on the result of the measurement in step 3. I understand that Hadamarding a qubit and then using CNOT on it and on other qubit entangles them and that's an important part of Teleportation. What I don't understand is how using CNOT on the message qubit and then Hadamarding it would help at all on the Teleportation process. Why would I want my message qubit to enter in a superposition state? I don't want to get a random value out of my message, instead, I want it to be transmitted to another qubit. I get that if a qubit A is collapsed to a message that I'd like to send and if a qubit B is initialized to |0>, CNOT(A, B) would transmit the message. However, what is the purpose of doing this operation if B is in a 50-50 superposition state? I mean, B's wave function would change from sqrt(1/2)|0> + sqrt(1/2)|1> to sqrt(1/2)|1> + sqrt(1/2)|0> How would that help in any way? But the worst part for me is that the method above works just perfectly. There must be something very basic I'm missing. Thanks for reading. what are new probablity amplitudes of a and b in terms of α1, α2, β1, β2?